My mo-in-law went to Cuba and god love her for thinking of my candy review hobby and grabbing the El Artesano candies on her escapade. She brought me the Turron de Jijona variety of candies from El Artesano (they have loads of other products, and they’ve been around for more than 40 years). There’s no doubt these are crafted well. The packaging keeps it well preserved and it appears almost homemade. 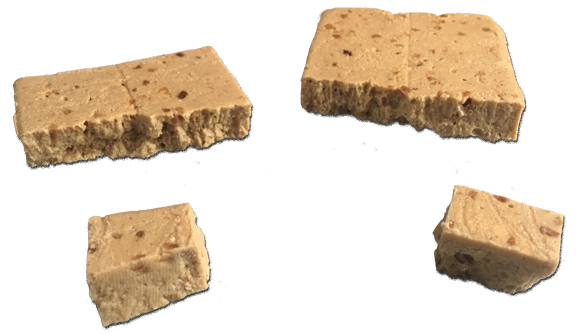 Turron de Jijona is “translated” (or maybe it’s “described”) as ‘soft nougat’. What IS nougat, as our friend Chad asked? A simple candy made from sugar or honey, nuts, and egg white. 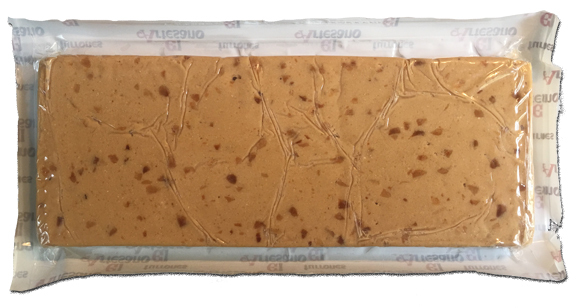 This particular nougat is a traditional holiday candy from Spain made with almonds – and honey (not sugar). The flavor is simple too, and very subtle. So subtle in fact I can’t really describe it…hm…nut oily ? … I know – probably not gonna get you clicking the “buy” links below. The honey provides the sweetness, without a ton of honey flavor. The texture is a soft grit, almost chalky. It’s so non-descript that after a few bites I don’t need much more. Perhaps these would be perfect after a long, filling holiday meal meat coma where I needed a little sweet to cut through my protein malaise. I’m betting these are well-loved in areas of Europe, but they’re not for me. I didn’t love how I had to de-package these things twice, and cut up into pieces. It was an oily activity and I had to wash my hands 3 times during the process. The candy itself would be interesting as part of something bigger. How about El Artesano puts a thin wafer around the nougat – a slightly salted dark chocolate – and add a burnt caramel hard layer – think Skor bar. Now THAT sounds good. I’ve traveled the world. I live in a city where I get all kinds of different foods, so although I have a distinctly American palate I think I’m cultured enough to be able to accurately discuss foods from countries not my own. Still, what I actually like is enveloped by my need for strong flavors and easy-to-eat. Because of this, the El Artesano nougat is just not my thing. But hey, this could be your thing if you love lightly nuanced almond flavor, old school sweet, and simplicity. I have to agree with review. While I haven’t tried the candy, I have standards and therefore would only consider nougat as a secondary flavor. A compliment to chocolate perhaps. Nougat isn’t the hot dog, it’s the mustard. so to speak.